In continuing with our efforts for a handmade decorated tree,we put together some pom pom garland today to replace tinsel. 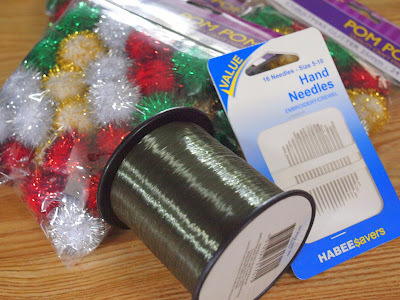 A few bags of sparkly pom poms, needles and some fishing line. Fairy Princess chose to work with a pattern using all four of the coloured pom poms. Simply tie off the fishing line at one end, so the pom poms don't slide off and start threading. 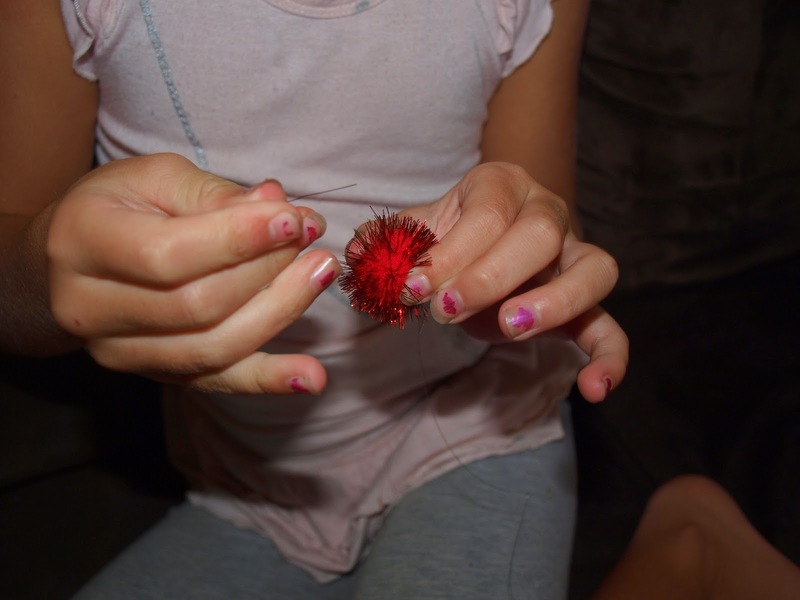 The one trick we found is to ensure you get the needle right through the center of the pom pom. You can tell the difference in the ones that aren't right in the centre as they move about the garland more easily. The center of the pom pom is much more dense than the outer edges so after threading a couple it's quite easy to tell if you have it in the centre or not before you continue to push the needle all the way through. We need to finish off a couple more to fill the tree but here's the first one, it's looks very pretty. Relatively subtle, very unlike the overbearing power of tinsel. Don't forget to check out Christmas Fun, loads of ideas and be sure to add yours over there too. That's gorgeous! Thanks for the idea - I'd love to replace the tinsel on our tree... it's horrible stuff! That is a cute idea. Our cats would love it. LOL! I love it!!! 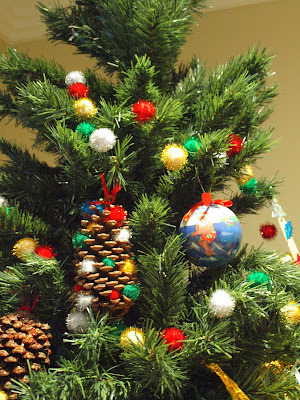 What a fun idea to have a completely hand-made tree! Thank you so much for linking up. I can't wait to see the other crafts you'll be making! That looks so cute! It would be perfect on my kids' little trees!